Don & Judy Hicks – Don and Judy Hicks, along with other family members purchased the Mayan Guest Ranch in Bandera, Texas from Bill Morse in 1951. The ranch had been established as a Girl Scout camp for a number of years and boasted 30 cabins. The Hicks family added 36 cabins and got to work developing one of the top destination Dude Ranches in Texas. Well known for their family atmosphere and good food, the Mayan ranch also involved the entire Hicks family that has grown to 53 family members and “we’re still growing”. 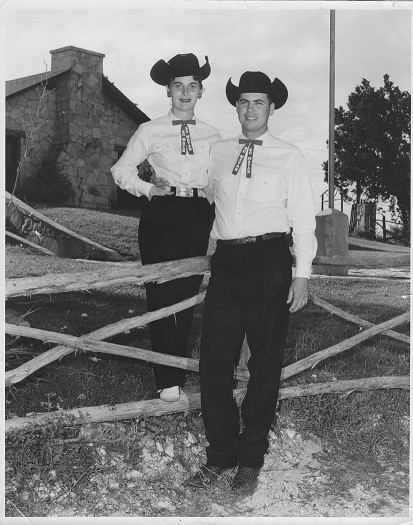 Don and Judy not only built a great Dude Ranch, they were the first to market the Texas Hill Country in Europe. In the late 1960’s the Hicks met Frank Hildebrandt, head of the Texas State Tourism Department. Frank invited them to London to the World Travel Market and from there; the Hicks took the Texas Hill Country on the road in three markets in England and one in Scotland. From that point forward, Texas has enjoyed the fruits of their labors as they spread the word about Texas and our Texas way of life. The Hicks family was then invited to the International Tourist Professional Powwow, a travel market place for international buyers. The Texas travel industry today continues to benefit from the first “Texas” contacts made in Europe.